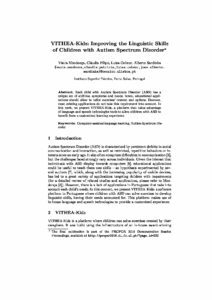 Each child with Autism Spectrum Disorder (ASD) has a unique set of abilities, symptoms and needs; hence, educational appli- cations should allow to tailor exercises’ content and options. However, most existing applications do not take this requirement into account. In this work, we present VITHEA-Kids, a platform that takes advantage of language and speech technologies tools to allow children with ASD to benefit from a customized learning experience.